Da Capo Press, 9780306815324, 328pp. In 1978, Greil Marcus asked twenty writers on rock-including Dave Marsh, Lester Bangs, Nick Tosches, Ellen Willis, and Robert Christgau-a question: What one rock-and-roll album would you take to a desert island? The resulting essays were collected in Stranded, twenty passionate declarations to such albums as The Rolling Stones' Beggars Banquet, the Ramones' Rocket to Russia, Something Else by the Kinks, and more. 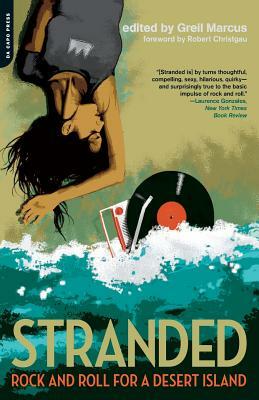 Universally revered as the ur-text of rock journalism, Stranded is an indispensable classic. Greil Marcus is the author of Like a Rolling Stone and Mystery Train. His columns have appeared in the New York Times, Salon, Esquire, and Interview. He lives in Berkeley.